The 2019 Stars and Stripes Academy (SASA) will be held Thursday, May 30th through Sunday, June 2nd, with registration opening at 12:00 PM (MST) on Thursday, May 30th, and will officially start with classroom training at 3:00 PM on Thursday, May 30th; and conclude Sunday, June 2nd at 12 noon. SASA will be headquartered at the Double Tree by Hilton Hotel Salt Lake City Airport, located at 5151 Wiley Post Way, Salt Lake City, UT, 84116. Their phone number is (801) 539-1515. Click HERE to be directed to their website. Reservation information and discounted room rates will be addressed as the Academy draws closer. The Double Tree offers complimentary shuttle transportation to and from the Salt Lake City International Airport and the hotel by calling (801) 539-1515 option 3. Travel to and from the Academy is the responsibility of, and at the expense of each official. Travel to and from the Double Tree Hotel to individual game sites is also the responsibility of, and at the expense of each official. Game sites for Saturday will be Woods Cross High School in North Salt Lake; and Viewmont High School in Bountiful. One of the unique characteristics of SASA is the competition between crews and between officials at their individual positions. Rankings will be based on the 2018 NCAA rules test scores, 2018 mechanics test scores, Saturday game video review, general appearance, and observed cohesiveness and participation. Some scores are objective while others are subjective. It is our attempt to replicate the true competitive nature of Division I football wherein officials work in an environment of “coopetition” w they must work and cooperate closely together, but at the same time, compete against each other for their ranking. Prior to the end of the Academy on Sunday, we will announce the #1 crew and the #1 official at each position. 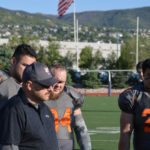 Teams are from the Rocky Mountain Football League, a semi-pro style league with players who are 18 years or older (click HERE for a link to their website). All games will be played using FULL NCAA 2018 rules, including game clock, play clock timing, and penalty enforcement. 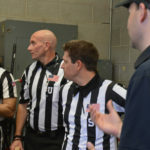 On Saturday, each crew will work one full length regulation game wherein the video will be graded immediately after the game and an overall score awarded to the performance as a crew and individual officials at each position. These Saturday game scores will be part of the criteria for determining overall ranking. Weather in Salt Lake City in May/June is very unpredictable. In May, the average high temperature is 71 degrees and the average low is 52 degrees. 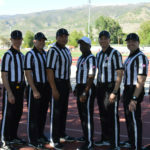 Wearing long or short sleeve uniforms is left to the discretion of each individual crew, but similar to D-I officiating, the crew must dress alike. Games will be officiated in regulation long pants and short or long sleeve shirts. If your shirt has an association patch which cannot be removed, it is fine to leave it on. As for flags and CFO patches, we will follow the standard as set forth in the 2018 CCA Mechanics Manual. It is expected that On-field officials have their correct position placard on the back of their uniforms. 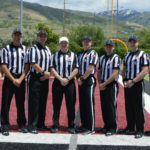 Non-field officials at the game locations can wear whatever is comfortable for them based upon the weather conditions. As for classroom training attire, we have no formal standard in place and we will leave that to the individual crews and Crew Mentors for both on and Non-field officials. Stars and Stripes Academy will provide light hors d’oeuvres at a Registration Social at the Double Tree Hotel on Thursday evening, May 30th, lunch at Friday noon and breakfast vouchers provided at check-in. All other meals including Friday dinner, Saturday lunch and dinner, and Sunday lunch are the responsibility of the individual officials. Some light snacks and water will be available during SASA, both in classroom and at the football field. Thursday: SASA begins at 3:00 p.m. with a general session followed by the SASA Social. Friday: Classroom training from 8:00 AM to 3:00 PM. This will include general sessions, individual position break-out, and crew break-out meetings. Saturday: Football games from 9:00 AM to 6:00 PM on one field and 9:00 AM to 9:00 PM on the other field. Sunday: 7:00 AM optional devotional. Classroom and general session training from 8:00 AM to 12:00 PM to include position break-out and crew break-out meetings. NON-FIELD OFFICIALS MEETINGS AND GAME DUTIES? 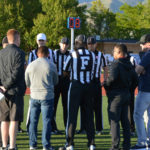 During “crew” break-out meetings, Non-field officials are expected to remain with their crew and be involved in the same activities with the crew as the On-field officials. Conversely, during “position” break-out meetings, Non-field officials are allowed to attend any position meeting they choose. They may attend different position meetings throughout the Academy if they so choose, but that is only during position break-out meetings. 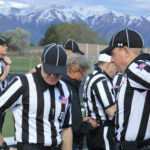 An alternate official will be one Non-field official who would go into the game at any position given the unlikely event an official goes down with an injury or illness during Saturday game. This alternate official would be in uniform, on the sideline, and would go into the game only if there is an injured or ill official. 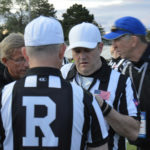 Similar to major conferences, this official may be utilized as a penalty recorder if the crew so chooses, or they may use any other Non-field official as the penalty recorder. The crew alternate official will be selected by the Crew Mentor and can be appointed at any time prior to the official start of SASA at 8:00 AM, on May 29th. In other words, the alternate could be selected months in advance, or, after inner-crew competitions and announced the day before the Academy. 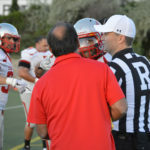 If needed to go into the game, the alternate official needs to be in a conforming uniform except for the position placard on the back of the uniform. Also, the alternate official must go in at the position the injured official vacated; except for an injured Referee or Umpire, in which case a double switch is allowed. 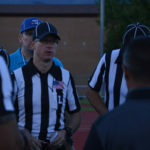 If an On-field official must withdraw and cannot attend the Academy, for whatever reason prior to the start of the Academy, the decision with whom to replace that official with a Non-field official will be left to the final discretion of the SASA Director and may or may not involve the alternate official. We anticipate taking photographs as crews and staff Thursday evening prior to the group social. We ask the entire crew to be similarly dressed (in full game uniform, or sports jackets, or matching polo shirts, etc.) There is no separation between non and On-field officials. So if the On-field want to be in uniforms, then the Non-field will also be in uniform. We will allow each crew to make that decision as a crew. 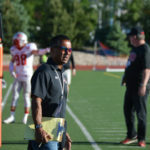 College Football Coordinators have been invited to attend SASA and they may circulate between position meetings, classroom, and game locations. Although they are welcome to come and observe officials, the intent of SASA is to provide a college training atmosphere. Stars and Stripes is not intended to be a networking experience, however, in the normal course of events, networking may become a byproduct of the Academy so officials need to be aware of this circumstance. All SASA game video will be available to all officials and staff following the Academy. A link will be provided after SASA where the video may be downloaded. 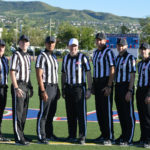 For those officials who have been selected as On-field officials, they must make a $750 deposit no later than February 24th in order to be eligible for the crew draft. Payment in FULL must be made no later than May 15th, 2019. For individuals registering as Non-field officials, a deposit of $375 to be placed on a crew. Special arrangements may be made for payment in full prior to the start of the Academy on May 30th. Academy participants will receive email correspondence regarding acceptable forms of payment and other details. This Academy is not about money; however, we have a significant number of expenses which must be covered prior to the Academy in order to make this a quality, unique, training experience. We have instituted a great way of creating crews for SASA. We have adopted a ‘draft’ style approach with the Mentors choosing their crews. After registration has been closed, we will go through the pain-staking task of evaluating each applicant. We will decide who should be On-field for the Academy this year and who should be a Non-field official. We spend hours looking through all candidates info, with dozens of phone calls to supervisors and fellow officials. Once we have determined who would best benefit from an On-field position we release that list at half time of the Super Bowl on February 3rd. Several weeks later, once the Mentors have had an opportunity to do some research of their own, a ‘draft’ is held. Randomly, each Mentors name is drawn to get the draft order and the draft begins. They draft in order and then in reverse order back up and so-on and so-forth. (1, 2, 3, 4, 5, 6, 7, 7, 6, 5, 4, 3, 2, 1, 1, 2, 3, 4, 5, 6, etc.) 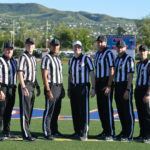 All officials who have been chosen as Non-field officials, will then be given the opportunity to be on the crew of their choice.